Design Exhibits (how will they be displayed? What will they look like? How will they carry the over all look and feel (or branding) of the museum? What artifacts will your museum display? Next: Creating a PROPOSAL for your museum. Pitching your idea with information and visuals. You will be responsible for submitting a design proposal answering most of these questions about your proposed museum. For this Design Studio Project you will create 2 variations of a poster design for East's spring musical, Hairspray. From your designs East Theatre Co. will choose 1 to be the official design (which will also be made into a t-shirt and marquee banner). The winner will receive $50.00 and a ticket to the performance. There will be an exhibit of posters during the performances on March 3, 4 & 5. The musical is centered around the main character, Tracy. A large-sized teen aged girl with a huge personality. Persuasive design applies psychological principles of influence, decision-making in a consumer context, engagement strategy, and social psychology to every stage of the design process, and it identifies potential barriers and emotional triggers to elicit the desired actions. First step : WHAT do you want someone to DO? Then build your campaign around that. Second step: Who is your target audience? Create a profile of them. How old are they, what do they like to do, are they male or female, what do they do in their free time? Answer as many questions about them as you can create in your mind. You are responsible for creating a campaign that tries to persuade your viewers to DO something. For this project you will be creating a project that showcases the anatomy and "character" of a font of your choice. Research: Find out as much information on the Font as possible. Try to avoid Da Font types of sites. You will not be able to find information about the history or creator of the font. 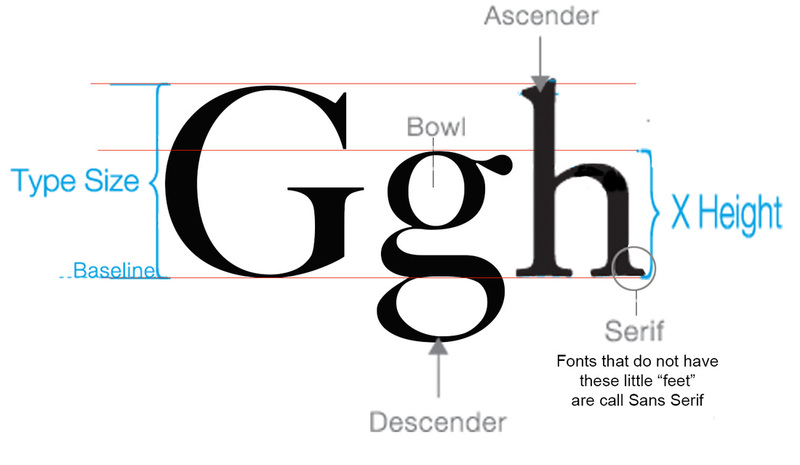 Show a diagram of the letterform anatomy (see example on right). You piece must demonstrate the "character" and visual story of that font. It must be unique! Use your own design style, don't copy the style of one of the examples here or what you find on the web. This project is not limited to posters. It can be animations, motion graphics, a book, what else can you think of? You are responsible for ONE (1 ) Design Studio Project . It is important for designers, artists AND photographers to expand their skills and practice incorporating words and imagery. Many self-employed professionals in these fields are responsible for creating their own promotional materials. ​Many creative companies also expect designers to take photographs and photographers to incorporate text and video into their professional responsibilities. Visit the Design Studio. You may choose the project you want to work on, BUT all projects must have multiple people working on them. (Graphic Design 2 & AP Studio Art). + Must be created in HIGH RESOLUTION & use the appropriate software. Logos must be created in Illustrator using VECTOR imagery. NO Powerpoint presentations: Think Creative!